Winter & Rain are the Pits !! Winter is two days away in Melbourne but I can’t complain as we have had a very mild, dry autumn. 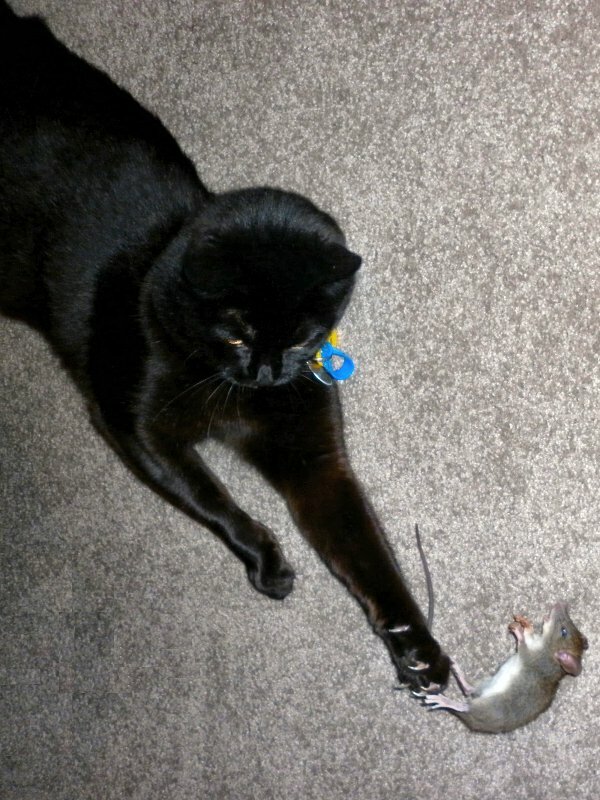 This mild weather has enabled me to continue my “war against vermin”, in particular, mice and rats. *Proud Ears* So since 30th November, 2012 we have successfully bought huMum 55 mice and 3 gianormous rats. You may not believe me but I assure you this total is correct as I’ve been noting every one of them in my “kill” diary. Think this was number 20? Tonight winter arrived two days early and with a vengeance with a low of 9C = 48F and a high of only 16C = 60F. Did I mention it was raining too? I love, love summer rain but not this chilly winter rain. In summer I’m happy to patrol, hunt and stroll around my neighbourhood in the rain, with the occasional visit home for a quick invigorating towel rub. Last year I was diagnosed with a smidgeon of arthritis but after treatment I was all better and huMum swore she would never put me through the indignities of having to see Jenny Vet every week as it was so very traumatic for me. This year we have decided to treat my arthrisits with glucosomine and fish oil. The third part of the treatment is for me to stay inside our warm home for long periods each day/night. No arguments from me with this as even I know being cold means being sore and stiff. We do have a MAJOR problem … there is no garden inside the house for me to use as my potty. For the last week huMum has been testing a litter tray in the laundry but I thought it was a new bed and now spend several hours a day sleeping there. I haven’t used a litter tray since I found my forever home with huMum and she kept me locked in for 3 weeks while I recovered from my little girls operation. Even then I only deigned to use it once a day! Tonight was a problem for me … it was raining that bitter cold rain we see in Melbourne in winter. There was a brief pause at about 10.30am and I made a dash for what I hoped would be dry soil under one of the Camellia Trees … blawky mud caught in my nails but I persisted and finally got down to some dry soil and did my business and rushed back to huMum standing at the door worrying about me. She let me clean my toenails on my scratching pole and then gave me the most delicious towel rub … I tell you I was purring like a steam train. Dry, snug & warm … purrfect bliss! See the tongue? NOTE: HuMum would like some suggestions on how she might convince me that the litter tray is not a new bed? As our winter deepens so too will my sore stiff bones and she is worried that I will remain determined to go potty in the rain and cold. Any ideas would be gratefully received – but please remember I am a wild panfur huntress who loves the outside world! I think that cats and Gibbons have so very much in common … love teasing! I am overwhelmed and thank Savvy so very much! bumpyroadtobubba – a trully delightful blog written by a monther about her daughter and two furbaby doggies. 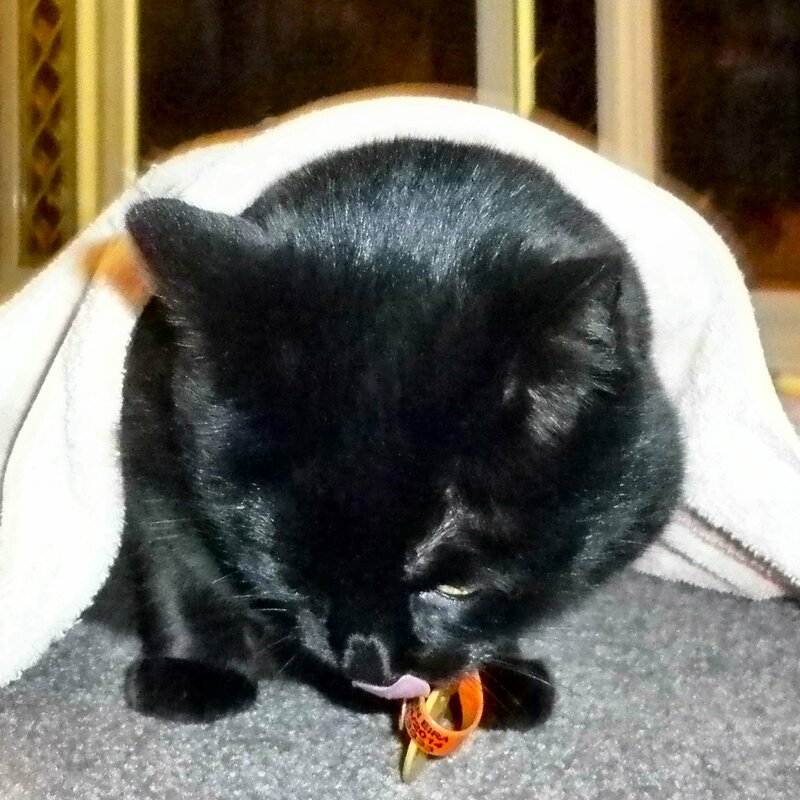 Pearl Cat and Her Family – TinyPearlCat is a very special ladycat and her blog is a delight! Rumpy Dog – Rumpy and his family have taught all us anipals so much, ty Rumpy! 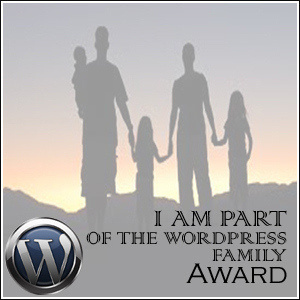 I hope they will agree that this WordPress award is somethingt to be proud of and pass onto others.